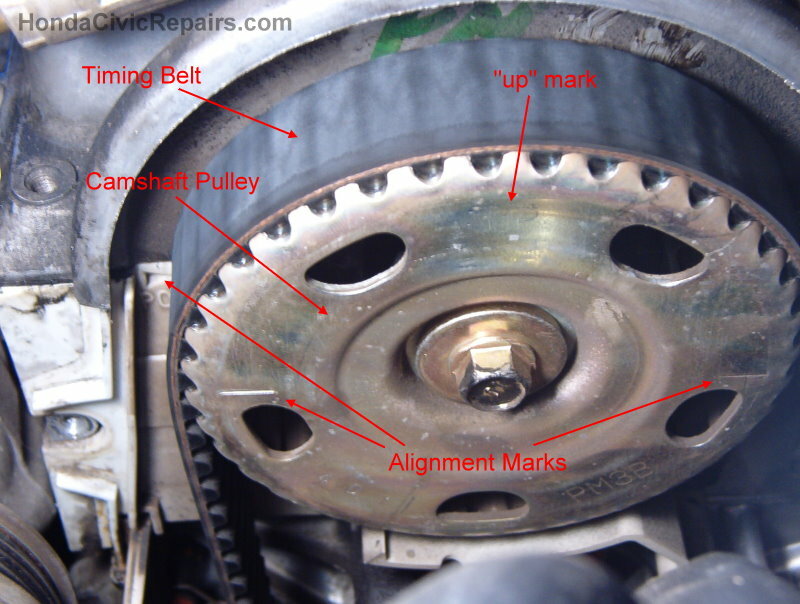 Driving beyond 100,000 miles beyond the expiration for a new timing belt can be a nerve-racking reminder. The car seemed to run fine without any problems but the haunting feeling of being stranded with damaged valves that will add to the burdening cost always linger. Finally, I came to my senses and decided to take on the timing belt replacement. After getting prepared with the right tools, I learned that more torque is always a good thing. The only show stopper I encountered was the need to have a stronger air impact gun to loosen the crankshaft pulley bolt. My existing air impact gun, capable of 700 lbs.ft, failed my expectations. If you're unlucky like me, you'll need something with more torque like 1000 lbs.ft. I eventually settled with buying a heavy duty impact gun used for 18-wheeler trucks rated at 1800 lbs.ft. The only special tool I needed for my job was a crankshaft pulley holder. 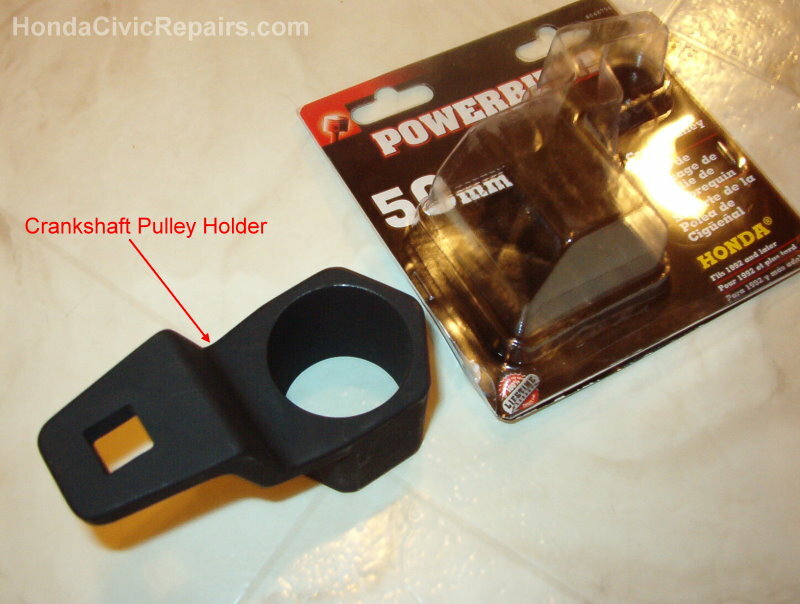 This will help hold the crankshaft pulley or spin the crankshaft pulley counter-clockwise as needed. 1. Jacked up the car onto jackstands and removed the wheel from the timing belt side. 2. Removed the splash guard to get better access to the crankshaft pulley. 3. Loosened the adjust bolts for the alternator to remove the alternator belt and removed power steering pump and brackets in order to remove power steering pump belt. 4. Slid a jack underneath the oil pan to lift and support the engine before removing the bolts holding the engine mount. 5. Removed the side engine mount. 6. 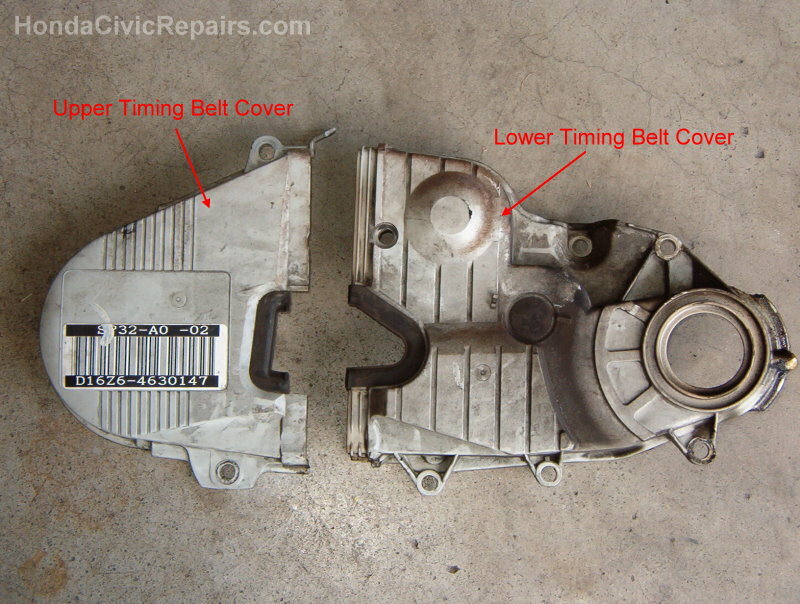 Removed the 2 bolts holding the upper timing belt cover. Unbolted the valve cover in order to lift the valve cover slightly to remove the timing belt cover. 7. Turned the crankshaft pulley counter-clockwise using the crankshaft pulley holder and a socket wrench until the markings on the side of the camshaft pulley lined up on the sides and the "up" mark on the camshaft pulley is positioned at the top. 8. 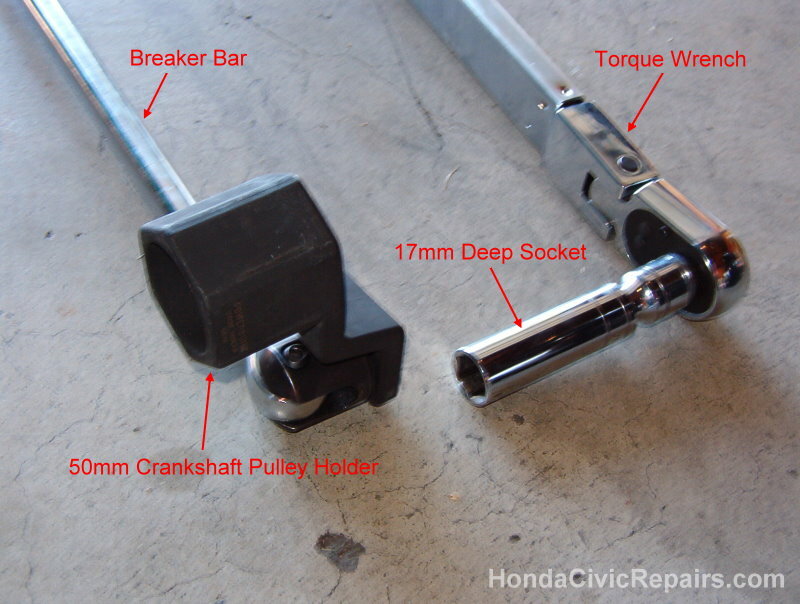 Attach a breaker bar to the crankshaft pulley holder and wedged it against the floor or iron frame. 9. Used an air impact gun to loosen the crankshaft pulley bolt (17mm)(counter-clockwise). 10. 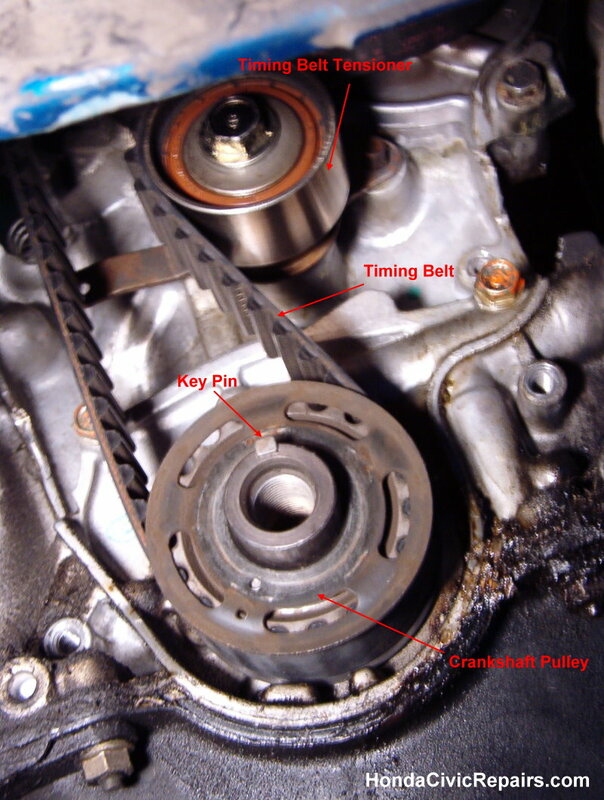 Remove the crankshaft pulley carefully as not to loose the small key pin behind the crankshaft pulley. 11. Removed the lower timing belt cover. 12. Loosened the bolt and removed the timing belt tensioner. 13. Removed the old timing belt and installed the new timing belt tensioner. 14. Cleaned the lower and upper timing belt covers. 15. Wrapped the new timing belt around the crankshaft pulley while avoiding the belt from oil or grease contact. 16. Extended the belt towards the camshaft pulley onto one tooth. 17. 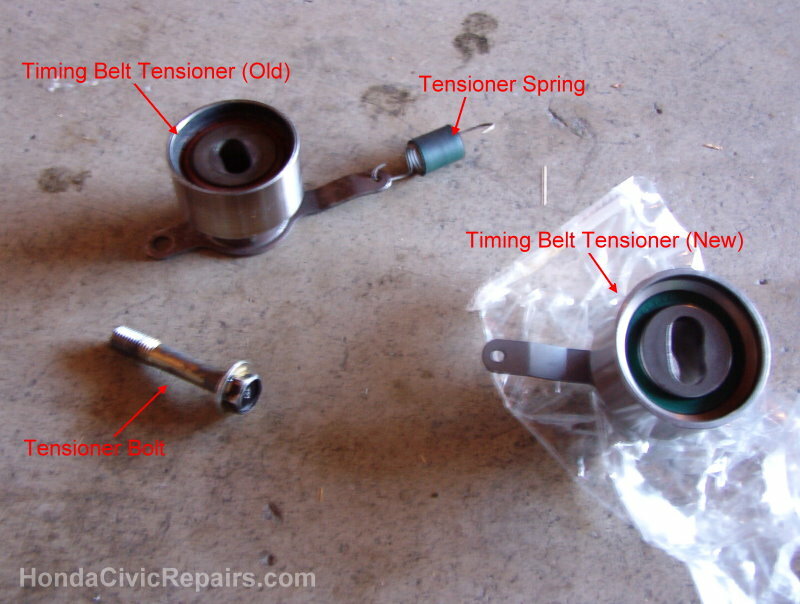 Wrap the other side of the belt around the belt tensioner then around the water pump pulley. 18. Pressed on the belt tensioner to get just enough slack to wrap the belt over and around the camshaft pulley. 19. Tighten the tensioner to the correct torque (33 lbs.ft). 20. Returned the key pin into the groove and returned the crankshaft pulley back on. 21. Tightened the crankshaft pulley bolt. 22. Turned the crankshaft pulley 3 teeth counter-clockwise to tighten the belt. 23. Cleared any obstruction around the timing belt area and started the ignition for testing the new timing belt. 24. Used a timing gun to verify good timing. 25. Loosened the crankshaft pulley bolt to remove the crankshaft pulley. 26. Returned and rebolted the lower timing belt cover. 27. 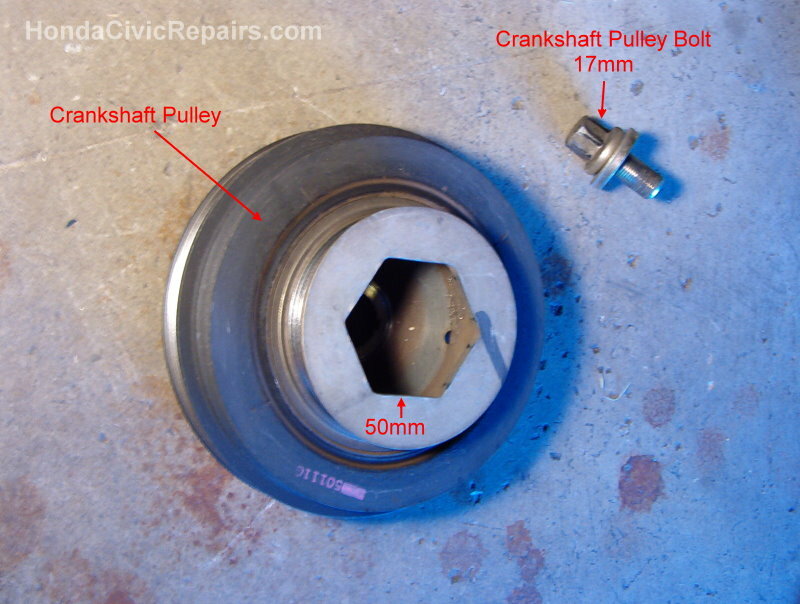 Returned the crankshaft pulley while making sure the key pin was firmly in place and tightened the crankshaft pulley bolt to torque specifications (119 lbs.ft for Civic 95). 28. Reinstalled side engine mount and rebolted the upper timing belt cover. 29. Tightened the bolts for the valve cover in specific order (center towards sides) and torque specifications (9 lbs.ft). 30. Reinstalled the power steering pump and bracket and the belts for the alternator and power steering pump. 31. Tightened the adjust bolts for the alternator and power steering pump with belts in proper tension. 32. Returned the splash guard and returned the wheel. 33. Lowered the car off the jackstands.